This handy guide looks at the 6 best camera sling bags around. Not all bags are equal, and no two photographer’s needs or equipment are the same. Having the right bag makes a world of difference. Some look at sling bags for cameras as fashion items too, and there’s nothing wrong with that. After all, who doesn’t want to look good with the clothes and accessories they wear? It’s important to get one’s priorities in order, though, so try not to fall in love with only a design or style. You may find later that it’s unfit for purpose, or your exact needs, to be more specific. This guide has something for all, from the lightweight traveler to the veteran professional photog. Some want lots of pockets and straps and others only a few. It’s all here, and there are some exciting choices. Photography can be an enjoyable hobby and a rewarding profession. But lugging all that equipment around is sometimes a pain—in the literal sense. It doesn’t have to be that way. You’ll know what to look for in a sling bag by the end of this simple yet practical guide. It’s an easy, down to earth read that only highlights those features that matter. A bag is a bag, but they all offer something different. It’s too easy to buy in haste, though. The idea of this guide is to get you to pause for thought, and thus make a better buying decision. Most of us don’t take all our camera equipment out on every shoot. Sometimes we travel light. Other times, we may pack a bunch of stuff, including a tripod and extra lenses—just in case. One could buy separate bags for different occasions of course. However, it makes much better sense to have a multi-purpose product if you can. The way to approach this is to jot down your needs. Photographic style: travel, wildlife, street, action, everyday shooting, etc. Environmental protection and other proofing: are you an all-weather photographer? Do you need a bag small enough to carry on a plane as hand luggage? You get the idea. The point is to think carefully about the equipment you use and what you carry. You’re more likely to get your sling bag right the first time with a little forethought. Always go with the best bag you can afford. It may be worth waiting a while if you see the perfect item that’s out of range. Just continue as you have been for a while until you have the funds. A good sling bag serves several essential functions, and they all play a part in the ranking process. They must provide ample protection for your equipment and distribute the weight evenly. You know that I’m an advocate of the checklist if you’re familiar with my other guides. Every photographer has his or her ideas of what a perfect camera bag should be—for them. There are options for all budgets as not everyone can afford or justify an expensive bag. Some of you are still building your photographic equipment and want something for the interim. Let’s look at the six ranking considerations in a little more detail and why they’re significant. Different materials serve different purposes. Cordura is a military-grade fabric and one of the most robust, water & abrasion resistant materials around. It’s also costly and heavier than other choices. Other, less expensive, and lighter fabrics can also work well. I don’t rule out any materials if they’re a good grade. It could be cotton canvas, tough nylon (including Rip-Stop), and PVC, etc. All materials bring something unique to the table. Camera bags normally use a mix of different fabrics for various parts and sections. It must be sturdy and long-lasting whatever they use. Inexperienced buyers often overlook the stitching. Even bags that use a suitable material can fall apart if the stitching’s weak. I avoid products with single sewing if it’s only a thin strand. Seriously, the stitch alone can make or break a bag. The double straight stitch is preferable, at least in areas where it matters. A 3-step zigzag or multi-step zigzag stitch is even better. A good stitch can’t protect weak zips—exterior or interior. That’s why I look at zip quality when ranking the different camera sling bags. There’s a lot more to zipping mechanisms than first meets the eye. Sling bag configuration is another ranking factor. 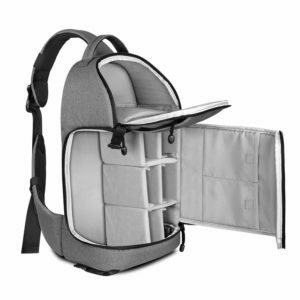 Multi-purpose camera bags have adjustable dividers. These let you configure the storage arrangement to suit your needs at the time. Having a choice of carrying options can be a blessing. These typically include shoulder straps and grab handles. There are also adjustable backpack straps with sling-bag options. And finally, there’s equipment compatibility. A good sling bag has compartments for photographic gear and other things besides. Having one bag instead of two or more is the smart way to travel. The ideal bag should have spaces for mobile devices like laptops, tablets, and smartphones. It should also have room for cables, chargers, and power banks to name a few other everyday items. The next section looks at typical questions people ask before they buy a camera sling bag. Q. What is a camera sling bag—exactly? Camera sling bags are a favorite midway choice between conventional shoulder bags and backpacks. They are durable, fashionable—yet simple, and a practical way to carry expensive gear around. A typical slim bag has one end of its trap at the top of the bag and the other attached at the bottom. The adjustable sling strap rests at a specific angle over the body for comfort and quick release. Sling bags vary in design. Some resemble backpacks but with an additional sling strap, and others look more like shoulder bags. They differ from a shoulder bags in that you wear the sling crosswise. Wearing the bag crosswise prevents it from slipping off the shoulder. It’s an excellent and comfortable system for long and short travel. Q. Should I buy a purpose-made sling bag for my camera? Purpose-made sling bags are compatible for a specific brand of equipment. But even these bags may provide the ideal mobile storage solution for other brands. That’s why you need to know your gear. To “know your gear” means you’re familiar with the dimensions and weight of your stuff. The last thing you want is to buy a bag only to find that your camera and accessories don’t fit. It’s better to have a little too much space than too little if you can still secure the kit inside. Q. What things should I consider with a camera sling bag? You already have an idea of what to look for if you read everything on this page thus far. Think about the stuff you need to carry. Check the bag or case has storage for personal items if that’s a factor. How many lenses do you take with you, and what are their sizes? Also know the height, length, and width of your camera. Look for a bag with external tripod straps as well if you carry one around. Also, check number of internal and external storage compartments. Is there enough for what you need? Consider the material used too, and any weatherproofing characteristic’s the bag has. The build, weight, stitching, and weight of the camera sling bag are other considerations. The stylish bag design is down to personal choice, but try not to prioritize style over functionality. Your sling bag must be easy to access and comfortable to wear. That means it has excellent ergonomic appeal throughout. It’s well-organized in a way that meets your specific needs and expectations. Q. Why not just use a regular backpack instead? A large backpack is the preferred option for some photographers. It’s especially useful for those who carry lots of equipment. However, they’re not the best choice if you don’t need the extra space. It takes extra time to pack and access your gear with a backpack. People also tend to over cram knapsacks just because they have the room. That makes them even more cumbersome. Camera backpacks are less comfortable if you move around a lot. Most sling bags have a smaller carrying capacity than others styles. Most still offer ample space for photographic needs, though. Below are six honest camera sling bag reviews. The format is simple and starts with the name of the product followed by a quick list of the bag’s main highlights. I then explain why I chose the sling bag for review, followed by what real reviewers (bag owners) say about it. At the end of each piece is a summing up of the main features and other considerations. Click to See Price: Altura Photo Camera Sling Backpack Those of you who read the introduction will know what to look for in a quality camera sling bag. 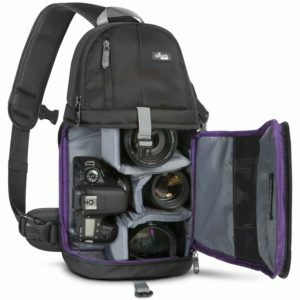 The Altura Photo Camera Sling style backpack checks a lot of those boxes at an affordable price. I call it the little big bag because of what it holds despite the small appearance. It’s a versatile product aimed mainly at amateurs. It comfortably accommodates most popular DSLRs with an attached lens. The bag also has room for five extra lenses, so six in total. That’s more than most amateur photographers carry around on an average shoot. There’s even space dedicated for a laptop and other accessories. You can play around with the padded interior and customize it for your needs. The weather-resistant (not weatherproof) nylon seems fit for purpose and should fare well in a light drizzle. So far so good, right? Well, yes, there’s a lot to like with this low-cost camera sling bag. But don’t forget it’s inexpensive for a reason. Everything is great—for the money—but nothing’s exceptional. I wouldn’t endanger my expensive gear in wet conditions without using a rain cover. I also get the impression that the stitching might give if the bag carries too much weight too often. The Altura Photo Camera Sling Bag sells well and ranks high. Yes, it’s cheap, but it wouldn’t sell well if it underdelivered on its promises. Over 80% of the reviewers in our research were happy with this product. The overall design and style get a lot of favorable mention as does the comfort and storage factors. The small mesh pockets also please bag owners according to the feedback. The exterior tripod or monopod holder is another welcome feature not found on all sling bags. And the big zip pullers make light work of cold hands when opening compartments. Owners love being able to access their equipment without having to rummage around. Quick and easy access is one of the great things about sling style bags. Not everyone is happy, though. Some complain there aren’t enough pockets (see intro). A handful of reviewers had issues with loose stitching, but it’s not a widespread complaint. And a few would like to see a water bottle holder. There are plenty of useful features for new photographers to consider with the Altura. It’s unlikely to be the one you end up with, but it’s an excellent first choice for a multi-purpose camera bag. It’s a durable and comfortable sling carrier for a product in its price category. Most important of all is that it’s a purpose-made camera bag. That means it has enough storage for a photographic setup. Always look at the inside of any camera sling bag carefully. This one has a padded area for tablets or laptops up to 14 inches. There’s room for other everyday flat electronics too like smartphones. The flexible padded dividers are quick and easy to organize. They do a great job of locking and cushioning expensive gear. This bag is as good as—or better than—any of the alternatives in its class. I also like the 3-month (90-day) 100% satisfaction guarantee. That says a lot about a company’s confidence in their products and offers reassurance to new buyers. Click to See Price: Zecti Sling Camera Bag for Modern DSLRs My second pick is the Zecti Camera Sling Bag. It’s another multi-purpose product that accommodates popular Canon Nikon Pentax, Sony, and Olympus Digital-SLRs. It’s got a pretty unique design too. What I like about this product is its dual-purpose design. You can have a simple recreational bag in seconds when you detach the interior separating board. There are the usual padded adjustable dividers inside to make light work of organizing compartments. The bag has space for a modern DSLR, four extra lenses, and a few personal bits as well. Not all photographers use camera support as it’s a hassle to carry around. But the tripod side strap is a welcome add-on to any sling bag whether you need it or not. After all, it doesn’t take up any space. Another thing I like about this sling bag is the protective anti-theft front buckle strap. It also prevents accidental dropping. And the bag’s rubber feet help to protect the bottom and keep it upright. The material is a high-density polyester advertised as ‘waterproof.’ My advice is to ignore any waterproof claims with cheaper sling bags and always err on the side of caution. Use a rain cover. The bag gets plenty of favorable feedback from reviewers. The most admired features are the highly customizable compartments and carrying comfort. It’s also bigger than it looks, say some owners. Some folks post photos of their Zecti Sling Camera Bag. You can find real user reviews with images of the owners either wearing it or loaded with gear. That’s invaluable feedback for shoppers on the fence. Users are happy with the fast access to their camera equipment. They also praise the excellent interior padding and joint protection. This sling bag satisfies most people, but it has a few critics as well. Some say it’s too small for their needs. That’s such an avoidable mistake as pointed out in my introduction. A more general gripe is with the actual shoulder strap. It seems that larger-framed reviewers find the shoulder strap too tight and uncomfortable. Others complain that it comes loose far too easily. Not everyone agrees, but it’s a definite issue for some. I’d say the Zecti Sling Camera Bag is a capable and affordable product if it has what you need. I’d also say it’s better suited for people of small to average build based on the reviewer’s feedback. The structure is practical as a small to medium sized camera bag. It has one main compartment, one upper compartment, two built-in pockets, and a side pocket. 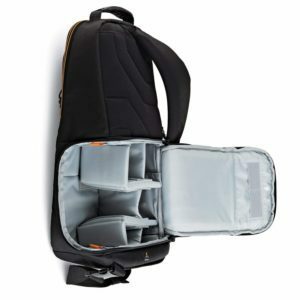 The main compartment comfortably accommodates a modern DSLR camera and selection of lenses. Its upper storage provides plenty of room for other electronics and personal items. There’s fast access at the sides without having to remove the bag. You can get quick access to your mono or tripod too, thanks to the rapid-release strap and buckle. Click to See Price: Lowepro Slingshot Edge 250 AW The Lowepro Slingshot Edge 250 AW is a gorgeous multipurpose protective bag with a lot to offer. It’s ideal for an entry-level DSLR setup, i.e., a camera, a couple of lenses, and a Speedlight flash. Also worth a mention is that it’s a good fit for DJI Mavic Pro and Mavic Pro Platinum drones. In general, this slim bag is a perfect choice for those who like to travel light due to its modest capacity. Sometimes less is more as it makes you think carefully about what you need to pack. It’s easy to throw everything into a bag with lots of space only to regret the extra weight later. The Slingshot Edge makes smart use of the space it has. There’s room for other things as well as a basic camera setup. You can store headphones, a wallet, smartphone, tablet, and other necessities. It has all the usual camera sling bag characteristics. The side pocket allows for fast access to the gear inside. The slingshot strap rotates the bag so you can easily access the inside without taking it off. What I like about this bag is its urban appeal. The lean design is a blessing when navigating crowded areas. Access to the main compartment is on the body side to deter opportunistic theft. Over 85% of reviewers in our research recommend the Lowepro Slingshot Edge 250 AW. What impresses folks the most is the comfort level and ease of swing the bag provides its wearers. I’m surprised by the amount of written feedback there is for a simple bag. That tells us plenty about user satisfaction. There’s also praise for the lightweight, durable materials, and all-weather cover. The extra, thinner underarm body strap gets a thumbs-up as well. Wearers like it as it offers additional support on longer walks or when clambering or jogging, etc. Unlatching it is also quick and easy. People love the rain cover as it’s tethered to the actual bag. That means there’s no risk of leaving home without it. It’s small things like the built-in all-weather cover that makes the 250 AW stand out. Some reviewers are unimpressed. One common complaint is that the bag doesn’t have enough space or there aren’t enough pockets. I say they simply failed to make an informed buying decision. A few complain that the interior arrangement results in wasted space. This gripe depends on the equipment a person carries. It’s always wise to do some homework before making a final decision. Most gripes from Slingshot Edge 250 AW bag owners are needless. The guide’s introduction explains how to avoid bad buying decisions. This bag offers everything for those who need what it has. It’s an excellent bag for people who don’t want or need the bulk and weight of a larger turtle-style design. The smart, well-thought-out interior can hold a lot more than most people think. As a multi-purpose camera bag, it’s comfortable to wear and easy to sling from the back to the front. Consider what you need to carry on a typical shoot and measure those needs against the bag’s specs. A modern photographer most likely takes a couple of extra lenses on a shoot. They almost certainly have a smartphone. They may also carry a tablet, various cables, a charger, and other everyday items. The Slingshot Edge 250 AW can accommodate all the above and more with its customizable interior. And the two removable straps with fast-release buckles are ideal for a monopod or small tripod. This bag is not the right choice for larger cameras and lots of equipment. It’s perfect for a lightweight entry-level setup, though, and for folks who spend a lot of time on their feet hiking or traveling. Click to See Price: Pacsafe Camsafe V9 Anti-Theft Camera Sling Pack The Pacsafe Camsafe V9 is an anti-theft camera sling pack. It’s a solid choice for travel photogs who navigate crowded areas and end up squashed into busy train carriages, or buses, etc. An anti-theft design is an important consideration for people who travel with costly camera equipment. It’s why bag producers make a point of adding theft-deterrence to their products. This smart sling bag has a hidden eXomesh® Slashguard stainless steel wire mesh in its fabric. What the durable, flexible anti-theft technology does is protect your gear against slash-and-run theft. Other protective features include the tough, lockable zippers and an RFID pocket to stop card cloners. You may never need the armor, but it’s a comfort to know it’s there. So, what else does this bag offer? Well, it has a smart interior. It should accommodate most modern DSLRs or a full-frame mirrorless camera. There’s also room for a couple of standard lenses, an iPad, or an 11-inch laptop. The adjustable padding does an excellent job at securing the equipment inside. I like the handy front accessory pocket too. It keeps all those other everyday bits and bobs together that we love to carry. 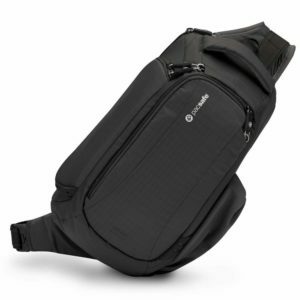 Reviewers love the security features of the Pacsafe Camsafe V9 camera sling bag. 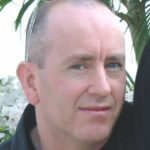 It seems the added layers of anti-theft technology play a vital part in most buying decisions. The bag provides all-day comfort, say reviewers, but not everyone agrees (see below). The padded top handle is another welcome feature. It’s convenient for when you want to carry the bag short distances. This sling bag is trendy among travelers, hikers, and commuters. It’s light too, despite the built-in anti-theft technology. The lightweight design is another box that reviewers are quick to check. Most people who buy this sling bag tend to be amateur photographers. They appreciate the extra protection for their cherished photographic equipment and other personal items. The most common gripe is with shortish straps. Whether they’re too short for you depends on your build, but some people are not happy at all. Is it a design flaw or a ploy to sell a sling extension? A few complain that the bag’s too small, doesn’t have enough pockets, or that it’s too costly. They still bought it though. And Pacsafe gives the capacity, specs, weight, and compatibility in the description. Most complaints are legitimate observations, but some are the result of buying in haste. When I first tried this bag, I stuffed it with as much gear as I could to test its carrying ability. It’s fair to say it held more than I expected. But I also found it a little off-balance when packed to capacity. Then V9 Anti-Theft Camera Sling Bag is very comfortable with a sensible load, though. If you need to stuff any sling bag to bursting point, then you bought one that was too small for your needs. It isn’t a large bag, but it’s big enough for what most owners want. A little homework now avoids disappointments later. The anti-theft feature alone is not going to check every box. This is an excellent choice of sling bag for photographers who like to travel light. It’s also unobtrusive. That helps the wearer to blend in without looking like the vulnerable lost tourist. The material is tough, but it’s not rainproof. The good news is the bag comes with a useful built-in rain cover. The rainfly does a great job of protecting your precious gear against the outdoor elements. Click to See Price: Peak Design Everyday Sling 10L The Peak Design Everyday 10L Sling looks different to other sling bag designs. It’s what you might call a pedigree sling, and one that doesn’t try to be anything other than what it is. It’s a good looker too. I chose this bag with minimalists in mind. It has a 10L capacity, but you wouldn’t know if from the low-profile, unassuming design. And like all sling bags, it provides easy access to the gear inside. There are lots of pockets and extra storage on the exterior of the bag. It’s simple to organize and quick to open. It has enough compartments for a modest camera set up and a bunch of other stuff to boot. What I also like about this camera sling bag is that you can fold it flat when it’s not in use. That means it takes up very little space if you want to pack it away when traveling. Peak Design’s Everyday 10L Sling also comes in a 5L version. That’s handy if you don’t need the 10-liter capacity. The price difference is around 50 dollars—give or take—so it’s a significant saving. 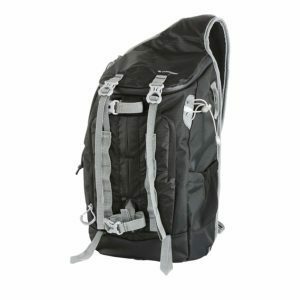 Peak Design Everyday 10 lt. Sling sells well and enjoys a high rating. Well over 80% of those who own one of these puppies would recommend it to others, according to our research, especially for amateurs at the entry-level. One of the first things to surprise new users is how much this bag holds. People like the look and feel of the durable fabrics too. That includes the soft yet protective inner mixed-cotton twill. Reviewers talk of the bag’s flexibility. They appreciate the way you can adjust the flex-fold dividers to create the perfect space. The lightweight and overall strength of the bag also gets a mention. This 10L sling bag seems especially prevalent among busy commuters and lightweight travelers. That’s because you can wear it on both sides of the body. The weather-resistant shell also gets a thumbs-up. Those who complain about the bag share common gripes. It’s either too small or too large for their specific needs. These are the all too familiar yet unnecessary buying errors. The most serious complaint I came across was poor stitching with the main carry strap. Most people don’t experience this. Still, there are enough complaints to suggest some defective bags have gotten out. Update: Peak Design is aware of the reported loose stitching issues with some of its products. Hopefully, it’s now an issue of the past for what is otherwise an excellent line from a reputable brand. The Peak Design Everyday line is a favorite range of quality bags. They don’t scream “look at me,” but they have an underlying wow factor for those who buy them. The 10L Sling here is no exception. The bag comes in three colors: black, ash, and charcoal. It’s flexible in every sense of the word. For example, you can use it as a capable camera bag or for everyday use to carry daily essentials. There’s ample space for electronics too. The bag can accommodate an 11″ tablet and 13″ laptop. And let’s not forget the internal slip pockets for all those extra everyday bits like phones and chargers. Carrying a mono or tripod is easy thanks to the external compression, quick-release straps. It doesn’t have to be camera support. You can also fasten a yoga mat, an umbrella, or whatever else fits. You’re also in luck if you happen to be the owner of a DJI Mavic camera drone. It’s a perfect fit for that quadcopter, its controller, and accessories, and there’s still room for extras. Click to See Price: Vanguard Sedona 34BL Sling Bag My final pick is the Vanguard Sedona 34 Sling Bag. It’s another versatile product with quick user access. It also doubles as a simple daypack when you’re not carrying photographic gear. As a camera sling bag, it comfortably houses a DSLR with an attached lens. There’s also room for a separate flash unit and all the usual accessories like battery, charger, and various cables, etc. The bag’s upper compartment is for those extra items. Such things may include tablets, smartphones, power packs, and so on. It also has a mesh slip pocket on the outside to carry a water bottle. There’s the familiar side access that lets wearers get to their stuff without taking the bag off. I also like the three ways to fasten a monopod, tripod, or whatever else doesn’t fit on the inside. It’s a comfortable bag to wear, and there are a few reasons for that. The first—and most surprising thing—is how light it is. It also has a detachable chest harness and breathable suspension system. This bag is capable of off-road adventures, and it even comes with a safety whistle attached. Staying with integrated features is the built-in rain cover stored underneath. There’s a lot to like here. I find the Vanguard Sedona 34BL Sling is everything it claims in the description. Despite this, it doesn’t enjoy the same level of praise from reviewers as other picks on this page. More on that soon. Those who do like this bag say it’s perfect for their specific needs. They praise its lightweight and compact design, comfort, removable interior compartment, and exterior straps. Reviewers also value the rugged zips and large pull tabs that give quick, easy access to the inside. Some find the top pocket an ideal space to store a lightweight jacket when they’re not wearing it. So why the negative feedback from some owners? You may guess the answer to that if you’ve read the other reviews. A few people find it too small and restrictive to carry all their kit. A few users say the strap is uncomfortable. It’s possible they overload the bag and try to cram too much inside. I say this as some of those complaints are from people who gripe about the lack of space. Another criticism is with the pocket that holds a 1.5-liter hydration reservoir. It does what it’s supposed to—at a cost. To exploit the reservoir holder, you must first remove the interior padding. 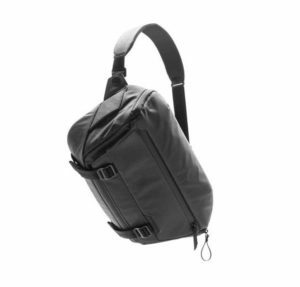 The Vanguard Sedona 45 is a lightweight, casual-looking sling bag. It’s ideal for carrying a small camera set up and a few personal items. It’s well-made and should last a long time with proper use. Some people buy based on appearance and then find their new sling bag is too small. It’s an excellent choice if it has ample room for what you need and a poor decision if it doesn’t. Vanguard’s Sedona 45 works well for daily commuters, lightweight travelers, and hikers. It’s skillfully constructed, and stitched the same way as parachutes to keep any accidental tears isolated. This bag is a solid choice if you need exterior carrying capability too. The convenient straps at the top can fasten down bulkier items like a sleeping bag or even a small tent. Wide padded shoulder straps help to distribute the bag’s weight more evenly. The adjustable harness strap keeps the bag stable. That’s especially useful when walking across uneven terrain. The padded back panels are another nice touch as they help the air to circulate adding to the comfort. Overall, this is a feature packed, quality sling bag that works well if it has what you need.